A Midland company has cracked one of the toughest markets for its produce – selling rice milling machines to China. But Solihull-based Koolmill said difficulties in accessing funds to expand was hitting its plans to establish a manufacturing base in the Midlands. Koolmill chief executive Alec Anderson has likened the firm&apos;s products as being the milling equivalent of the Dyson vacuum cleaner but says he has been frustrated at the firm&apos;s inability to secure UK funding or Government backing. Instead the firm is developing its business in China through a joint venture and is now seeing its machines manufactured over there. Mr Anderson said: "It&apos;s a bit like James Dyson – what he was doing with vacuum cleaners we are doing with milling machines and taking on a global industry. But we&apos;re looking at big customers and they are waiting to see how it pans out. "When you&apos;re selling a £300 vacuum cleaner people are a little bit miffed if there&apos;s a problem but if you&apos;re running a mill you&apos;re going to need 5-10, £30,000 machines. "We&apos;re a small company, there are huge commercial risks and so it&apos;s pretty tough but China has a different attitude to here in the UK. For years we have been trying to raise money in the UK to set up a manufacturing operation. "I think it comes down to the fact we don&apos;t easily fit into any of the categories and intellectual property is an intangible asset, which in banking terms has no value, so can&apos;t be borrowed against." Koolmill had hoped to set up a Midland manufacturing base employing up to 40 people and still has hopes of doing so to cater for the premium end of the market. 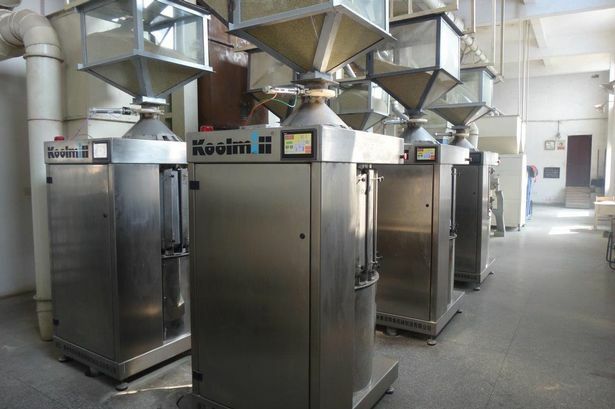 Its joint venture Quzhou Koolmill (QZ), which has a 20 per cent stake from a Chinese venture capital company, is small-scale at present manufacturing rice milling machines in a 9,000 sq m factory the city of Quzhou. It employs 25 people and this year aims to produce 200 machines, increasing to 1,500 to 2,000 machines within 3-5 years producing an estimated income of £40 million. Koolmill has plans to expand manufacturing to India and possibly Brazil. Mr Anderson added: "I&apos;d like to think we could have access to funding here in the UK on reasonable terms but the reality is that for us it is not there. I would like this to be a British technology and being made in Birmingham. "You hear about the Business Bank and LEPS etc but our experience is it&apos;s a bit like a bargain flight – when you go to get it is isn&apos;t there. "China is extremely supportive and we are grateful for the support of government at all levels as we seek to change the culture of a globally significant but ultra-conservative industry."